Thanks to our Chase Sapphire credit card points, we ended up staying in an area of Prague (Prague 3 district) that was slightly off the tourist trail. We were located east of the Vltava River and a solid two-mile walk to the main square in Old Town, which is where many visitors go to see famous sites like the Old Town Square and the Astronomical Clock. As a result, we spent more time in our area of town, where there were relatively few tourists, affordable dining options and a more authentic glimpse into the city life. The streets were quiet and there were small parks at every corner. We literally got to see a different side of Prague! Of the restaurants we came across, there were two that were so good (and affordable) we just couldn’t say “no” to a second encounter. The first was called Café Pavlač. It is a small café with an assortment of great drink options, from iced espresso to grizzly milk, which was what brought us there in the first place. It wasn’t until we got there and tried it out that we learned their food is just as outstanding! We are talking freshly homemade gnocchi with spinach and turkey, quinoa salads, and grilled ciabatta sandwiches. Both of us continued to ask one another “who is the chef at this place?” because the food and the overall presentation were incredible. If you’re looking for a good coffee, reasonable prices, and fair portions for your buck, don’t miss Café Pavlač! 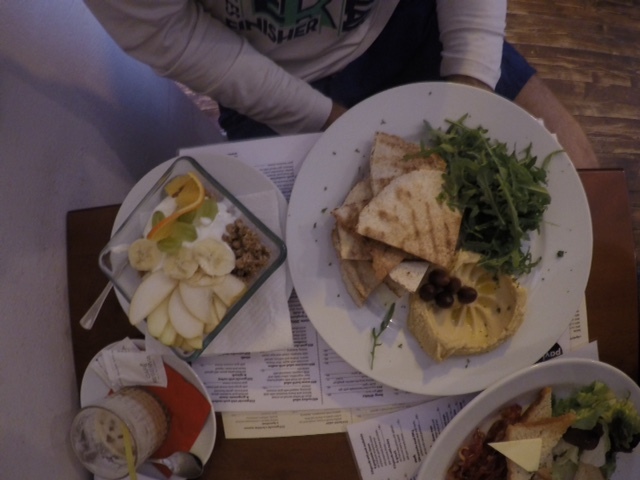 Our first meal at Café Pavlač! The second “must-eat” of Prague in our opinion is a small little pizza joint called Pizzeria Persona. Yes: it’s exactly what it sounds like! With a vast assortment of individual-portioned pizzas and calzones, there are so many delicious ingredient combinations. The term “individual” is certainly relative, for most people might consider it a meal for two. But for the pizza-loving Kimble family, we were able to get the job done. Once again, the price is budget-friendly and the staff is very hospitable. So, while we admit to not doing much advance planning for our trip to Prague, we definitely lucked out with the location of our hotel. We were able to eat at some really delicious places that didn’t break the bank! For anyone looking to visit Prague but hoping to get outside of the main square for food or lodging, we recommend heading east of the river towards the Prague 3 district. It’s within walking distance of all main sites, but is also quickly available by bus or tram for those looking to get off their feet for a bit. Check out the link below or visit the “Kimblesinbits” Youtube channel for our video recap from Prague!